Prime Minister Saad Hariri is headed back to Beirut via France after an odd visit to Saudi Arabia. PARIS — Lebanon’s Prime Minister Saad Hariri said Saturday he will return home in the coming days from where he will declare a political stance for the first time since making a strange resignation announcement from Saudi Arabia that unleashed fears of a political crisis in Lebanon. 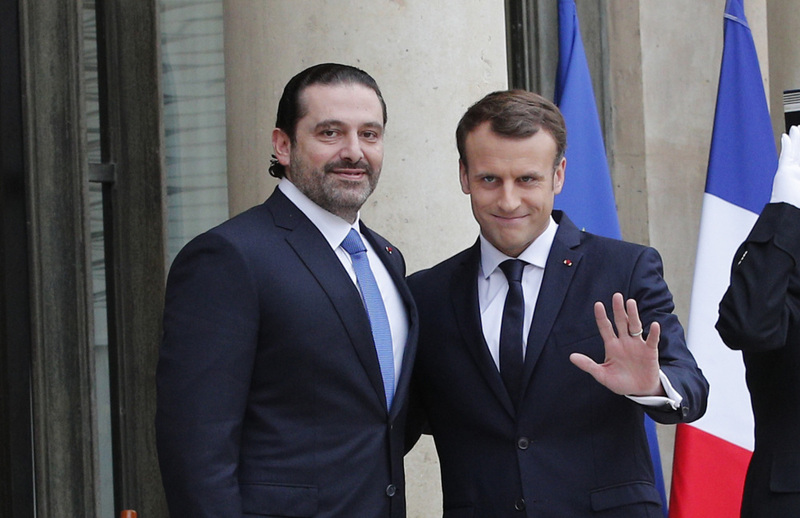 Hariri and his family met Saturday with French President Emmanuel Macron, who invited the Lebanese leader to Paris to dispel fears that he was being held in Saudi Arabia against his will. Macron is seeking to calm tensions and avert a proxy conflict between Saudi-backed and Iranian-backed camps in Lebanon. Hariri’s appearance in Paris – looking relaxed and posing with his wife and older son on the steps of the Elysee Palace with the French presidential couple in front of a large crowd of journalists – contrasted with his limited-access, carefully choreographed appearances from Saudi Arabia. Hariri told Lebanese President Michel Aoun on Saturday that he will take part in Independence Day celebrations in Beirut on Wednesday, according to Macron’s office. A French presidential official said Macron spoke Saturday with Aoun, who thanked France for its efforts to help Lebanon. The Independence Day ceremony is usually headed by the president, prime minister and parliament speaker, and Hariri’s presence could help calm uncertainties that have escalated since his strange and surprising resignation announcement on Nov. 4 from Saudi Arabia. However, Hariri’s political status is murky. Lebanon’s president refused to accept Hariri’s resignation, accusing the Saudis of holding him against his will. Before leaving Riyadh, Hariri dismissed as “rumors” reports about his alleged detention in the kingdom. In a tweet, he insisted his stay in Saudi Arabia was to consult with officials there on the future of Lebanon and its relations with its Arab neighbors.